When Andrés Duany asked Steve Mouzon to put out the call to New Urban Guild members for Katrina Cottage designs the week after Hurricane Katrina, one objective he had in mind was that they should grow easily. But easy growth turned out to be very difficult to accomplish. Because as the cottages became smaller, the exterior wall space became more precious, being eaten up for cabinets, bathrooms, closets, beds, etc., until there were usually very few ways to expand. So the initial Katrina Cottage designs were small, and they were charming, but they did not expand very well, if at all. All of the designs on the following pages are based on Steve’s design for Katrina Cottage VIII. This design was roughed out before the Mississippi mega-charrette, but not fully executed until nine months later for the USA Weekend magazine article on the Katrina Cottages movement. This cottage is radically different from all others that came before. So different, in fact, that we designated it as a brand-new type: the Kernel Cottage. Like a seed, or kernel, the Kernel Cottage can easily sprout and grow into a larger house. Most of the remaining Katrina Cottage designs in this book are based on this design; they illustrate several of the ways in which the Kernel Cottage can grow. If you don’t build expandability in at the very beginning, it will never happen. So that’s what this design does. The very first design move was to place four “Grow Zones” at each corner of the main room. Each Grow Zone, because it’s located in a corner, has two “sprouting spots” from which it can allow growth through doors, or through windows which can be converted into doors. Grow Zones are maintained as circulation spaces, with nothing except movable furniture allowed into them. 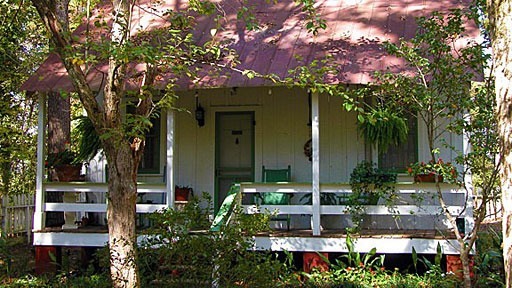 This cottage has also been used to illustrate another point: Katrina Cottages can be exceptionally green due to a number of design features detailed in a later chapter. Katrina Cottage VIII, for example, would be LEED Gold or LEED Platinum depending on where it is located in a town and how it is sited on its lot.